As fuel costs continue to rise inexorably, energy efficiency is top of the agenda for most boiler owners. 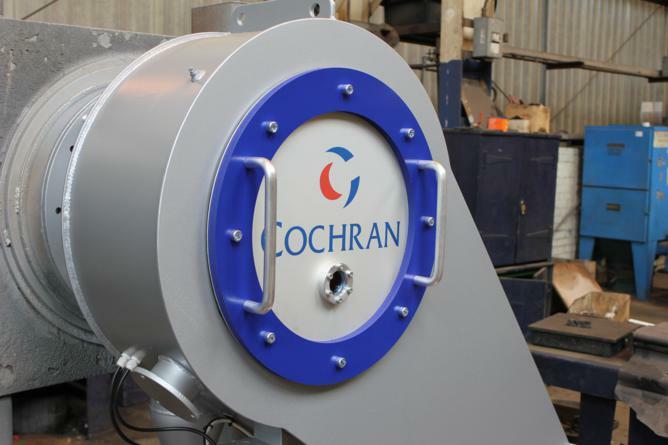 As UK’s premier manufacturer of industrial boilers Cochran has always long been at the leading edge of advances in efficiency and fuel use reductions. Cochran are recognised as global leaders in efficient use of costly fossil fuels for Steam and Hot Water generation. Energy efficiency know-how gained building and improving leading boilers like the Wee Chieftain, Borderer and Thermax units has enabled the Cochran to develop a range of upgrades for existing plant, covering all aspects of combustion control and monitoring on both Cochran and other maker’s systems. Cochran designs, builds and retrofits Economisers on all types of boiler. Use of heat recovery units are an important factor in maximising the efficiency of modern Hot Water and Steam generation systems. The harvesting of previously wasted exhaust heat as it is expelled through the flue regularly delivers operational cost savings in excess of 5%. The long working life of a Cochran boiler means that many units in excellent operational condition are now considered extremely in-efficient. The shell, pipework and ancillary equipment may well be in perfect working order, but are now costly to operate because they are coal fired or their combustion units are wasteful. Cochran can rejuvenate older plant using a comprehensive range of retrofit products that can bring ageing equipment up to modern standards of economy and change firing to gas, diesel or dual fuel. Retrofits also improve reliability and operational safety, as well as reducing the man hours required for operation, often enabling businesses to cut boiler house staffing levels. Cochran provide fuel conversions for almost any industrial heat or steam boiler. Conversion to gas, diesel or dual fuel firing from traditional heavy oil or coal can deliver significant cost and emissions reductions and reduce maintenance, as well as simplifying fuel handling and improving the control and reliability of your boiler. The company supplies and installs new, efficient combustion systems with the latest control systems, making all the modifications to the boiler required for maximum efficiency and safety using the new fuel. Natural wear and tear, tough operating conditions and sporadic or ineffective maintenance can all take their toll on your boiler. Under normal conditions, boiler shells outlast the rest of your boiler plant, so it makes sense to improve the boiler and take advantage of modern improvements in technology and efficiency in the middle years of its operational life. As a global leader in the provision of heat and energy, Cochran has vast experience in upgrading all types and brands of industrial boiler and ancillary plant. Projects can range from simple fuel conversions to total boiler house refurbishments that address every aspect of plant control, combustion and monitoring. New components and the latest systems offer a broad spectrum of benefits, particularly when it comes to improving fuel efficiency and reliability and reducing emissions. In some cases increased automation and better control systems can even achieve reduced boiler house manning levels; delivering significant savings as a result. Cochran Economisers recover previously wasted heat from boiler exhaust gases, using it to pre-heat the boiler feed water; often improving the system’s thermal efficiency significantly. Subject to the limitations of the boiler, Cochran Economisers can deliver fuel cost savings in excess of 5%. A short Heat Recovery & Economiser survey enables our experts to determine a plant’s waste heat recovery potential. Whilst economisers are usually fitted to natural gas-fired systems, the Cochran can also design and fit specialist systems for some liquid-fuelled boilers. Safe, efficient boiler operation demands regular inspection and servicing. Special attention needs to be paid to water quality and the deposits that reduce safety and efficiency, resulting in damage to the boiler and a reduction heat transfer efficiency. The company has developed a highly effective chemical descaling service. Chemical descaling is a non-invasive cleaning technique that is the best way to free your boiler from scale and corrosion; this maximises efficiency and also prolongs its operational life.